My friend, Laura, was about to throw away some old magazines, and she asked me if I'd like to have them. Since they were all about cooking, of course, I said yes. Eventually, I got around to browsing an issue of Taste of Home, and I found a bunch of recipes that all start with a can of refrigerated crescent roll dough. These little bits of heaven were the first to get my attention, and they looked so simple and quick, I decided to try them. I did make one little change, though. You know how the crescent roll dough has perforations when you pop it out of the can? Well, the recipe required you to press them together to make squares of dough, rather than triangles. So, I figured, why not just buy the solid sheets of dough instead of the crescent rolls and just cut them into squares? It makes sense, right? So that's exactly what I did, and it worked perfectly. Chris and Claire were happy to do the taste test for me and told me they were "slammin". Actually, it was around 5:00 pm when I brought them to them, and Chris said "These won't even make it to 6:00." True Story! So, give these a try. They're simple enough for a novice baker, and they only take a few minutes to prepare. Perfect for a Sunday Brunch! Unroll crescent dough. If using the regular crescents, separate into 4 rectangles and seal together the perforations. Cut each in half making 8 squares. If using the solid sheet, simply cut it into 8 squares using a pizza cutter or a very sharp knife. In a mixing bowl, beat together the cream cheese and 1/4 cup of powdered sugar. Spread 1 tbs diagonally across each square. Top with 1 tbs of the raspberry pie filling. Pinch together the 2 opposite corners of dough over the filling to seal. Bake on a parchment paper lined baking sheet for 10-12 minutes or until golden brown. Stir together 1/2 cup powdered sugar with the milk until smooth. Drizzle over slightly cooled danishes. Try not to eat every single one of them in one sitting. I guess the main helpful hint in this recipe was the using of the solid sheet of dough instead of the perforated one. It really just made everything so much easier. Plus, it makes a nicer cleaner finished product. 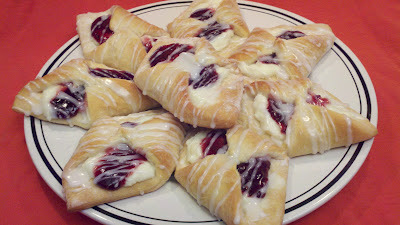 You could even make mini danishes by cutting it into 16 tiny squares instead of the 8 large squares. Of course, you would use half as much filling, but the baking would remain the same. If you don't have pie or pastry filling, you can also use raspberry jam. I was concerned that the jam might melt and drip down the sides of the danish, so I used the pastry filling, but feel free to use whichever you prefer. Substitute any flavor you like! Pineapple, strawberry, blueberry, cherry, peach, and even chocolate would be FABULOUS with the cheese filling, or just let the cheese stand alone!